There’s no question: winter in Canada can present some of the most unpleasant driving conditions on the planet – especially if you’re not prepared. Canadians know better than anyone that your car takes a beating during cold winter months–but that doesn’t mean we all know what to do about it. At Master Mechanic, we want to keep your vehicle running smoothly all year long. 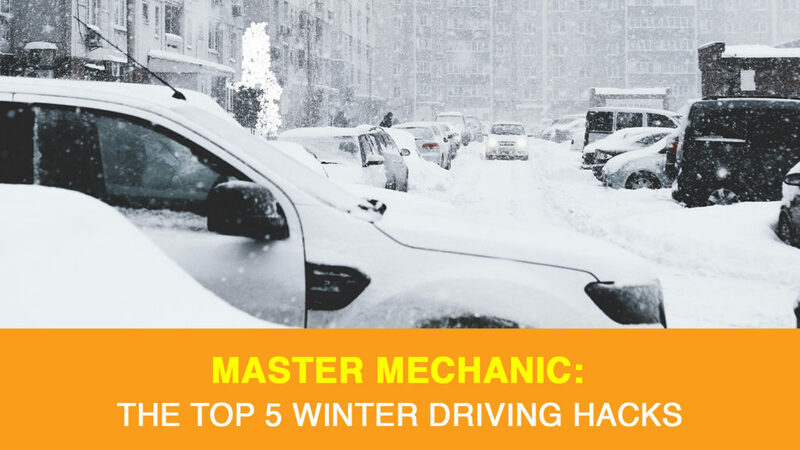 That’s why we assembled the top Winter driving hacks that will help your car make it through the coldest days. A lot of us take our windshield wipers for granted – until they freeze over. Leaving your windshield wipers up at night is a simple and easy way to prevent them from collecting ice and snow. Doing this also leaves your windshield clear to wipe with a snow brush the next morning. If, however, you’re expecting a snow or hail storm, it might be a good idea to leave them down and just cover them with a sock! In extremely windy conditions, lifting your blade can do more harm than good. Accumulating ice can weigh down your wipers, causing them to crash down with force and crack your windshield. Winter months and foggy windshields go hand-in-hand, and it can be quite dangerous if you’re on the road when this happens. To quickly clear fog without leaving a streaky mess behind, try keeping a clean chalkboard eraser in your car! It works wonders to wipe away fog. Have you heard about wiping shaving cream on the inside of your car windows? No, it’s not a joke! Shaving cream and commercial defoggers have a lot of common ingredients, and the layer it leaves behind will help prevent fog from forming in the first place! Simple apply the shaving cream with a cloth, wipe clean, and enjoy a fog-free windshield. When it comes to defrosting your windshield, the best offence is a good defense. Try parking east every night, if possible. As we know, the sun rises in the east and will start to melt ice first thing in the morning, while you’re still getting ready. If parking your car facing east isn’t possible, try applying a solution of three parts vinegar to one-part water. Spraying the mixture onto your windshield will help stop ice from forming at all. The same goes for your wiper blades, too! Try soaking a soft cloth with 100% rubbing alcohol and rub each one down. The alcohol will keep the blades from sticking to the window when the temperature drops. Whatever you do, never use hot water – no matter what your instincts tell you. You could end up shattering your windshield, instead of melting the ice! This one is pretty simple. Like your wiper blades, your mirrors can freeze over. If you don’t have heated mirrors, this can be a pretty time-consuming and potentially dangerous problem to deal with. Covering your mirrors with plastic bags will prevent them from freezing and speed up the time it takes you to get on the road. Just slip them on before you go to bed and secure them with elastic bands. Slip them off in the morning, and the accumulated ice will come off with them. Using a small amount of cooking spray in the seams of your doors and on the rubber will prevent them from freezing shut. Water that melts during the day drains between your doors and freezes, but cooking spray keeps the water from pooling in the first place. Keep two twenty-pound bags of kitty litter in your trunk throughout the winter – and on a snowy day, you’ll be glad you did. Why? They’ll add some weight to your rear-end which is excellent for traction if you have rear-wheel drive. If by chance you do get stuck, you can spread some under the tires, and your shoes, for added traction. If you don’t keep kitty litter on hand and get stuck in a snow bank, you can also use your floor mats. Just place your front floor mats under your tires to gain some traction, and don’t forget to pick them back up before you get going! There you have it. Easy DIY tips and tricks you can use to combat winter’s impact on your car and commute. For winter tire installation, fluid top-up, or repairs of any kind, you can contact your local Master Mechanic to schedule an appointment. We’re here to make sure you’re ready for winter!